In summer, there is nothing better than going for a picnic in the park. The bright sun, blue skies, and birds chirping in the air with good food and drinks to complete the picture. But once you get there, you need a blanket large and comfortable enough to relax on or even take a nap on. Are you going to a sporting event, outdoor concert, or camping? A picnic blanket will surely come in handy. Picnic blankets come in all shapes and sizes, and finding the perfect one for you will take some effort. Here we have simplified this for you. We have lined up our top 3 picks for the best picnic blankets available on the market. As an extra bonus, we have a budget product that we are sure you will love. Before you rush to your outdoor event, grab one of these cool blankets. This quality product from Practico Goods is simply awesome. Judging by its name, this picnic blanket is indeed extra large. Measuring at over 60 square inches it is large enough for your picnic with many other people. The size doesn’t mean that it is hard to haul around, as it is made with cotton fleece that makes it light and it is designed foldable, making it easy to carry. When rushing to the beach or out for a picnic it won’t add a huge weight to your load. 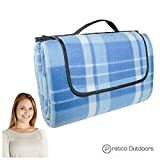 This makes it the ideal picnic blanket, large enough for many people to use at the same time and yet light and portable. It is best left tucked in the trunk of the car for on the spur picnics. The waterproof material is good for areas where the ground is wet, soggy, or damp. Anything placed on top remains dry including people sitting or lying on it. It functions well as a sporting blanket and repels water if it rains at the game. It can hold 4 people comfortably and keep them covered. The fleece side keeps you warm when you wrap it around you and the back side keeps you dry. This is great when temperatures suddenly drop to guard against the wind and the cold weather. Additionally, it folds up easily thanks to its design. It holds up well on all surfaces with varying moisture content. On the beach with rocky and coarse sand, or in the fine sand it handles well. On grassy lawns that are wet and full of dirt or on concrete, this Practico outdoors blanket is the perfect picnic blanket to have. 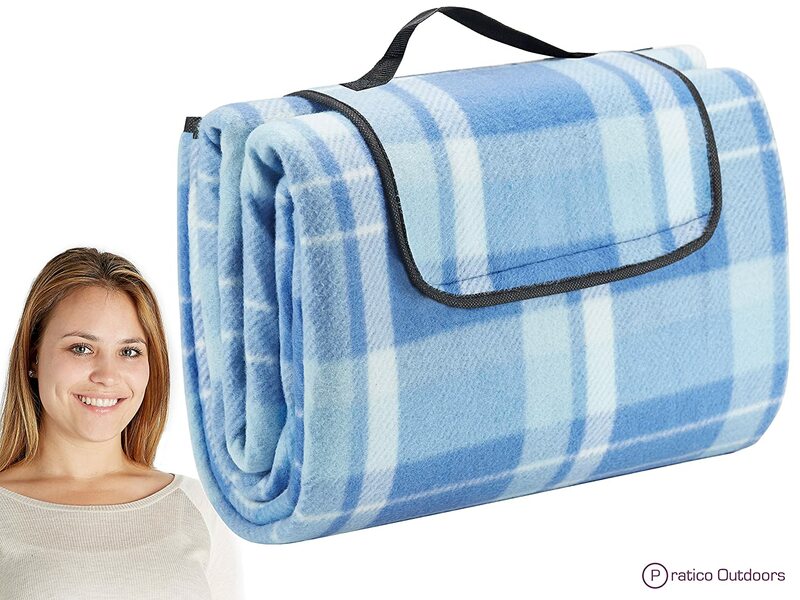 It is the only true picnic blanket on this list due to its delicate soft fleece top side. This makes it even more special, and especially comfortable. Material: It is made of 100% cotton fleece that makes it soft and allows you to relax on it for long periods without irritating your skin. The cotton fleece is also thin enough so that it’s not too warm for the outdoors. Its material makes it easy to get rid of the sand or dirt that may have gotten onto it. 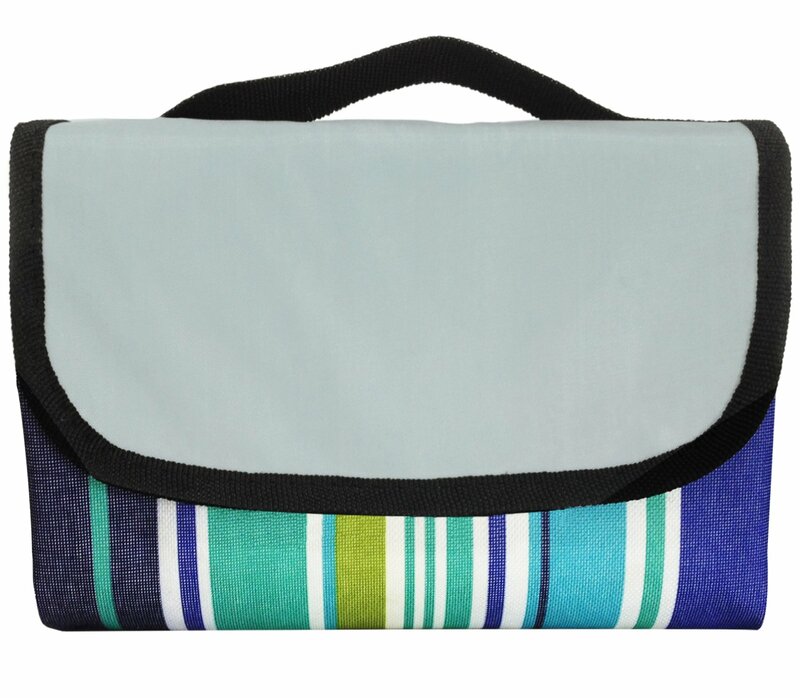 Size: Huge size at 60 x 80 inches when unfolded completely and weighs in at only 1.3 pounds, which is unbelievably light making it easy to carry to your picnic venue. Rolling it back up after use is also easy. 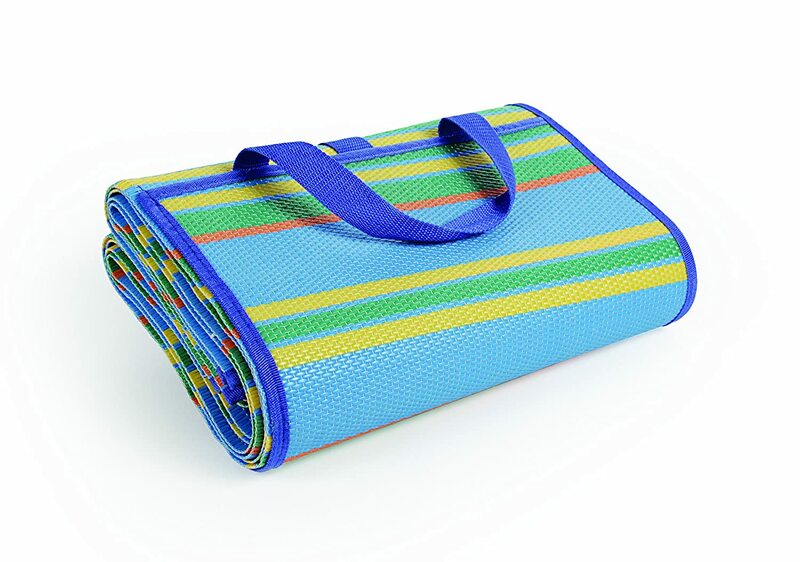 Waterproof: This picnic blanket is waterproof with a cushioned backing making it ideal for placement on damp surfaces leaving you dry, and it provides a great, solid surface for any goodies placed on it. It is waterproof only on one side, the fleece side isn’t. It can even handle you sitting on it for hours on the wet ground. Foldable: In spite of its size, the Practico Outdoors blanket easily folds down into the size of a purse with a portable size of 10 x 16 inches. To fold it, when its open, take one side and move it over to the center, repeat this on the other side. Fold the halves together i.e first fold it into quarters then roll it up and Velcro it shut. Refund policy: Not satisfied with your purchase? No worries, Practico Goods offers a 30-day refund or exchange for products purchased. Colors: It comes in different shades of red and blue stripped colors. Though it doesn’t have a wide color selection, the colors available look great with nice patterns to choose from. Washing: The blue and red blankets are not machine washable; they can only be hand washed or spot cleaned. However, the premium navy blue blanket is machine washable. Since these blankets are sturdy, even after many washes they still retain their new look. After washing, they dry pretty quickly. A bigger size that measures 58 x 80 inches and weighs 2.5 pounds. The 100% polar fleece has an added 220gsm. It folds down or rolls into a size of 8 x 17.5 inches, and a carry strap is included. The waterproof back side has reinforced polyester or nylon to increase resistance to water and the wind. Not easy to roll back the same way it comes. To counter this, roll it up and use the Velcro to enclose it instead. The back side is a bit slick, so when on a gradient on a lawn it may slide a bit, this is not too big a problem, but it may make it a bit uncomfortable. The Attmu beach picnic blanket is a relatively large blanket that is quite tough and perfect for the outdoors. Its polyester material makes it easy to clean dirt and sand off of it. 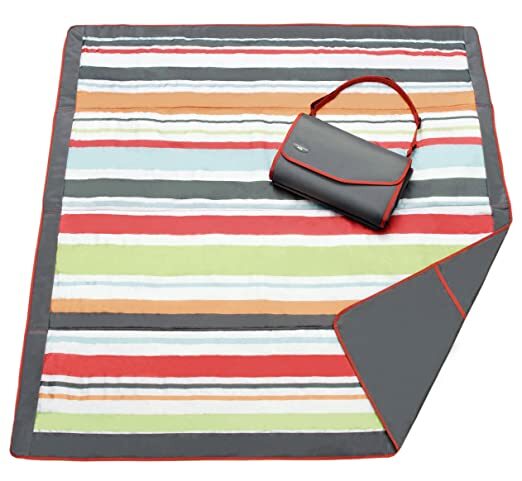 The blanket has a fabric magic tab to keep it closed, which is a Velcro-type flap that makes it easy to carry. This blanket is not as flimsy as most and it is weighted and cannot be blown by the wind. This is ideal for windy areas, so you don’t need to go chasing after it, unlike most blankets on the market. It is also a single stitched fabric on top and waterproof material at the bottom. Since it is made using a type of plastic, PVC; after you purchase this blanket you may notice that plastic smell that can be unattractive and overwhelming. Well to remedy this, just leave it outside for some time to air out, and the smell should fade away. Have any pets? No problem, your furry friends can jump on top of this blanket and it will handle them perfectly. If your pet or pets aren’t house-broken and happen to go to the bathroom on the blanket, the urine will not soak through. All liquids easily run off, making it easy to clean and freshen back up. It can also serve as a bench top, so picnics at picnic table can be a more comfortable experience as well. Material: The Attmu blanket is made of polyester and PVC. This makes it strong, durable, easy to clean, and mildew resistant. It doesn’t wrinkle easily so you don’t have to worry about how it will look after folding it up. Size: This picnic blanket measures at 78 x 59 inches and weighs 2.05 pounds. Waterproof: It is waterproof, moisture proof, and sand proof. This makes it dependable for picnics on the beach or when camping. If you happen to be caught in a thunderstorm you can use it to cover yourself up since it has a waterproof back side. Foldable: It is easy to fold and can be compacted to transport and store easily. It has a carry handle and is also easy to unfold and use. When you are done, you can fold it back to its original position which is 6.5 x 10 inches. Make sure you pay attention to how you unfold it since it is a bit tricky to fold it back to its original state. Refund policy: It has a quality and satisfaction guarantee allowing you to try it risk-free and return it for a refund if you aren’t satisfied. Colors: Striped design with multiple colors. Washing: It is pretty sturdy therefore can be washed both by hand or machine. When clean, take it outside to dry. It is not soft to sit on because it doesn’t have a cotton fleece top like the Practico Outdoors blanket. It also can get really hot and isn’t that pleasant on your bare skin on sunny days? To prevent this, you can place another blanket on top. This outdoor blanket is durable and is fun for all outdoor activities, from the lawn to the beach it is truly ideal. It is comfortable to sit on and is perfect for long hours on the beach. It has a sturdy insert sewn into it for extra comfort. If the picnic area is damp, no problem, the JJ Cole blanket is suitable for any surface thanks to its waterproof bottom. It is also sturdy enough not to allow grass to poke through. Additionally, it is a cool travel blanket which folds into a messenger bag. When it is time to go, this blanket is easy to clean and remove the sand from. To carry it around the insert has been sewn in properly for folding and it has a strap that can be attached to hang on your shoulder. Don’t have a place to put your keys or phone? The JJ Cole blanket has a nice sized pocket perfect to hold any of your small items leaving your hands free to carry more stuff. This blanket is also cool to use indoors. Place it on the floor as a safe place for kids to play on all they want. It is truly an ideal blanket for the whole family. For those who like moving around, it works well since it quite heavy and doesn’t crumble underneath. Material: It is made of polyurethane for the waterproof outside, polyester for the top fabric and the inserted filling is made of polyester foam. The material is perfect for the sun, staying out for hours without hot. Size: It measures at 5 x 5 feet when open and weighs only 3.2 pounds. Waterproof: Perfect for wet or damp areas it is waterproof thanks to the polyurethane material. Foldable: Easy to carry around by folding it up into a convenient size. Folding it is made easily and quickly by the guidelines that have been stitched on. The detachable strap can be hooked on and adjusted for anyone to carry it around easily. It is stylish to carry looking like a cool bag or purse. Refund policy: This and all JJ Cole products have a warranty that is for 90 days against defects from the manufacturer. Colors: It comes in 8 different colors. The two colors it may come in, refer to the blanket’s exterior and its trim. The colors are blue iris, blue orbit, gray / green, gray link, prairie blossom, stone arbor, gray / red, and citrus breeze. Washing: This blanket can be machine washed with a commercial size washer though since it is easy to wash, grab a hose and wash it down easily. Hang it out to dry after washing. Since it has a polyester foam inserted in, it tends to be bulky hence a bit heavy for carrying around. If you are not careful the Velcro may cause some damage to your delicate clothing. Fold it over so that it doesn’t get in the way. Made by Camco company, which has made its name making products for the RV industry, this mat is surely one that has been made with care and excellence. Its tradition of great customer service and with more than 3,000 products, the Camco company has truly made a handy mat. It comes in large sizes perfect for various activities, such as picnics and RVing. This means for a picnic, a group of 5 can sit down and have some food in the middle easily. When folded, it has pockets on either side making it convenient for carrying items for your outdoor party. The Camco mat has been fitted with fabric edging to reinforce the blanket, this helps to prevent it from fraying. After use, simply shake it to get rid of any dirt, debris or sand. When used in direct sunlight it doesn’t heat up and remains cool to your bare skin. For extra comfort, carry a blanket and place it on top of this one. It comes in attractive colors that are reminiscent of the beach, so as an extra bonus, it will make you feel like heading to the beach. Since it is made with a weave kind of pattern, it isn’t sand proof as such though it allows sand to fall right through it. Any water that spills on it also goes through it. This is awesome for the beach because no damp spot will be left on it when any person coming out of the water sits on it. It is not like a convention blanket and doesn’t stick to you when you get sweaty. To hold your water bottles or even sunscreen, the Camco mat has pockets for them. Material: Made from polypropylene that is a durable material capable of lasting over a long period of time. It is even UV-stabilized. Size: It weighs 2 pounds and its dimensions when opened is 78″ long x 60″ wide. You can also get it at a larger size of 72” long x 108” wide. Waterproof: The polypropylene is waterproof for keeping you dry. It is also resistant to mold and mildew. Foldable: It can be folded to a compact size to be only 15″ long x 10.5″ wide making it ideal for storage in a closet or trunk. Handles are built-in on both sides for easier carrying, and they can also be hung on your shoulder. Since it is light in weight you can carry it with you all the time. Colors: You get four color options: blue / green, blue / turquoise / green, green / white / red, and orange / green / blue / yellow. Washing: Based on the material it is made of, it is not machine washable but it is easy to clean by using soap and water. Wipe it using a washcloth or hose it down and let it dry. The Camco is lightweight and perfect for carrying. This, however, turns into a disadvantage when in windy conditions, even a slight wind is enough to lift the corners of the mat. To avoid this, place something heavy on all sides of the mat to anchor it. Alternatively, affix small wire tent stakes to keep it in place. Nothing can ruin a fun day out more than a rain. If you are out for a picnic and it drizzles a bit or you have come out after a light shower, then you will need a waterproof blanket. No one wants to sit on something wet, so this is a mandatory feature. Check if the picnic blanket is waterproof and won’t be damaged by water. Since going outdoors is a summer event, beach trips are never far off. That means being close to the water. It’s not cool if you of your kids can’t sit down after playing in the water without getting your blanket wet. Despite the fact that you usually go on picnics with others, many picnic blankets are quite small. However, like many things, the larger the better. Besides, you never know when you will have a couple of friends meet you at the beach or at a sporting event. Aim to get extra large blankets that are practical for whatever use you have for them. If you feel like taking a nap, the picnic blanket should be large enough to fit your body while still leaving room for others. Also, ensure that this large blanket can easily be rolled up or folded into a manageble size that can be easily carried. The material the picnic blanket is made of is key. This is because it will determine so many factors. If you plan on going to the beach often, the material should be cool enough to handle the heat. The heat can make the blanket uncomfortable to sit or lie on. The material also shouldn’t be harsh on the skin, since you will probably be lying on it. It should be nice and smooth on your skin. For parents with young kids, ensure that the kids won’t be harmed or have their skin irritated by the blanket’s material. Since the blanket is made for outdoor use, it should be easy to clean. Outdoors, accidents could happen at any time; liquids or food could spill onto the blanket or your pet could have an accident on it. Where you place the blanket could also make it dirty, muddy, wet, sandy, or filled with debris. Having a blanket that you can brush the dirt off of easily or clean quickly with a washcloth is ideal. It can also be machine washable thereby offering even more convenience in its care. Most blankets can now be hosed down and they dry quickly. Aim to get one that is “hose-down” friendly. Picnic blankets will be transported and lugged around from one place to another. This means that how portable it is will determine if you will even bother buying it. Don’t be fooled by the size of the blankets. Many of them can be folded down into a decent size for ease of carrying. Having extra features, such as handles or even shoulder straps simplifies carrying even further. Velcro straps help in keeping the blanket together when packing it. Check to see if these straps are available for the blanket you want to purchase. When choosing the right blanket for your particular use, always go for the most practical option. All of the blankets above meet the needs of most people. They have their own unique aspects that make them useful for particular occasions, which will help you make an informed decision. All the blankets we have chosen have lots of desirable features. Our best pick, the Pratico outdoors extra large picnic blanket is the crème de la crème that doesn’t get any grass or dirt embedded in it and will last for many picnics to come. Grab one today enjoy the benefits of eating and lounging outside.